Thank you for your interest in Mount Pleasant Home! 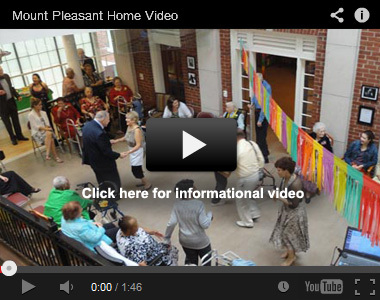 Mount Pleasant Home offers a caring and compassionate home for seniors aged 62 and older. We are a perfect option for seniors who need just a little help, not a nursing home. We offer a safe, warm, nurturing environment where elders can live as independently as possible. Enjoy your privacy while living in a small community of 60 residents, with plenty of opportunities to socialize as you desire. Spend your days doing the things you love without worrying about home upkeep, cooking, cleaning, medications, and loneliness. We take care of all those things plus provide 24 hour staff presence. Our history goes back to 1901, and today over a hundred years later, we continue our commitment to compassion and care for elders. Come visit us and learn more about what makes us special.